Saying the name right may just be the only difficult thing about the Zuchon. Everything else is peachy. 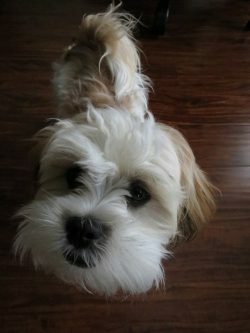 A mix between the Shih Tzu and Bichon Frise, the Zuchon, or Shichon, is not officially recognised as an actual breed yet. It’s been reported that the American Kennel Club will accredit the breed with its official name after a few generations. Although it’s a young hybrid developed only in the 1990s, they have become highly sought after. With its low-dander and low-shedding coat, it’s easy to see why. Although those characteristics alone are enough to score a recommendation on most people’s list, we’ll give you a roundup of everything you need to know about this gorgeous designer dog. An alert, lively and affectionate dog, the Zuchon enjoys playing with and being around people. As such he doesn’t do well being separated for long periods. His intelligence, tendency to crave attention, and eagerness to please make him easy to train. Early socialization and training are important to bring out the best in him. When training him, teach positive things and use positive techniques. 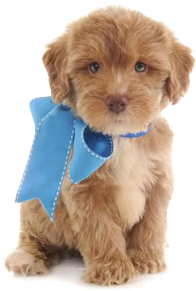 The methods and the kind of training that you give your pet ought to be consistent. Be patient and firm with your training, treats, rewards and praise are the way to reach him. Weighing a mere 8-16 pounds and growing to the height of a single ruler, they are perfect for snuggling. They fit perfectly in an elementary school kid’s arms. Zuchons are not as delicate as they appear. In fact, they were originally bred to serve as therapy dogs for people with disabilities. They even have softer bones that resist breakage better than other breeds. So go ahead and give your Zuchon the big hug he deserves! They are very intelligent and can easily home in on their owner's feelings. Don’t be surprised the next time you’re sad that your cute little Zuchon jumps on your lap!